Soap making really isn’t as scary as I once thought. While I did try my hand at making soap from scratch once (with lye, goggles and everything), I much prefer to leave that to the pros. These days it’s all about the melt and pour soap base. After cleaning out my stash the other day, I came across several soap base remnants from past projects. Rather than throw them out I decided to turn them into this super hydrating goat milk soap. Perfect for things like eczema, sensitive skin, or just plain ol’ seasonal dryness, goat milk nourishes skin and replenishes critical vitamins and nutrients so your skin stays soft and supple. I first tried goat milk soap years ago and immediately fell in love. If you have sensitive skin like I do, you need all the help you can get when it comes to keeping irritation at bay. Goat milk contains minerals such as selenium and Vitamin A which are critical for healthy skin. It’s loaded with alpha-hydroxy acids which help slough away dead skin cells and decrease irritation. 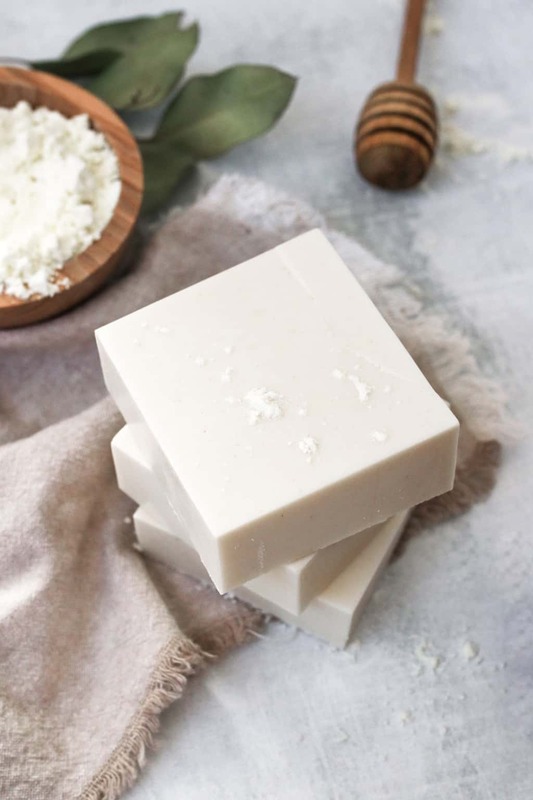 And thanks to an abundance of essential fatty acids, goat milk creates a moisture barrier that traps moisture in the skin and prevents it from drying out. But even you don’t suffer from eczema, psoriasis or other sensitive skin issues, goat milk soap can still work magic. It does everything from balancing skin pH and fighting infections to preventing premature aging and soothing sunburns. Seriously, it does it all. For a little extra healing power, I also added raw honey and almond oil to this soap. Raw honey is anti-bacterial and full of antioxidants while almond oil is loaded with Vitamin E and essential fatty acids. Last but not least, a few drops of carrot seed and myrrh oils help reduce inflammation and promotes healing. Because it’s so gentle, this one bar of soap can be used as body wash, face wash, shampoo, bubble bath, even shaving cream. I love making a big batch and storing the extra bars in my bathroom so I always have some handy. I’ve also been known to give it to friends and family during the colder months so they can reap the benefits too. 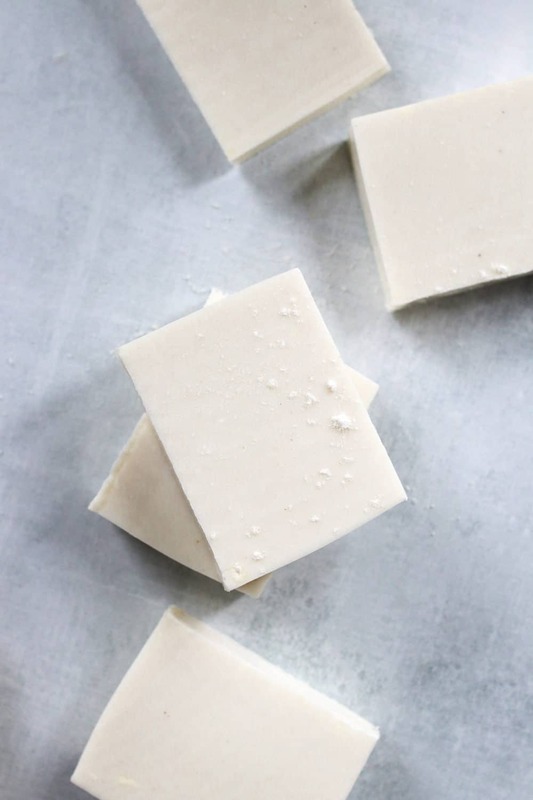 Chop the soap base into small cubes and place in a microwave safe bowl. Microwave in 30-second intervals until completely melted. Add the powdered goat milk, honey and oils. Whisk well to get rid of any clumps. Pour the soap into your mold and set aside to cool. 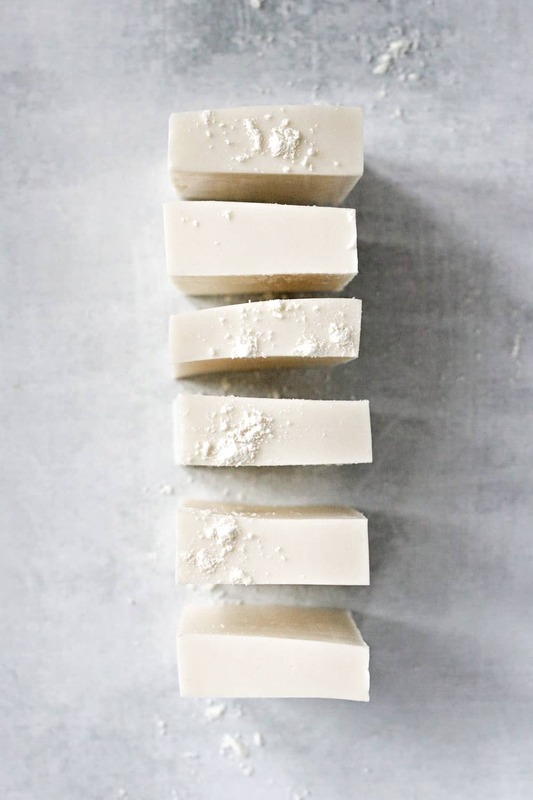 Once it’s solidified, use a sharp knife to cut the soap into bars.